Do you use Slack to communicate with your team? If so, you can integrate your Teamup calendar with your Slack workspace, so you and your team can receive calendar notifications within Slack. 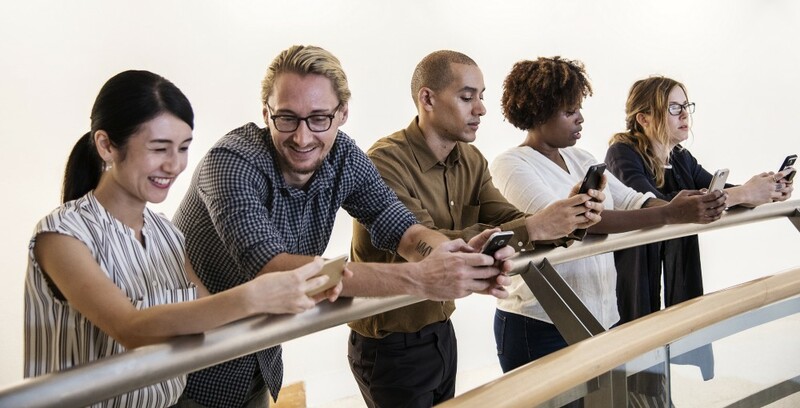 Slack notifications will help your team stay up-to-date on plans and schedules, streamline communication, and reduce the number of emails that you receive each day. Here’s how to set it up, securely. When setting up Slack notifications in a group channel, security is very important. You need to use a calendar link with appropriate permissions.Every Slack notification contains the calendar link in it; so anyone who can access the group channel can also find and use the calendar link used to set up the Slack notifications. If you are a non-admin user, don’t use your personal calendar link; doing so would expose your personal link to the entire group in the Slack channel. 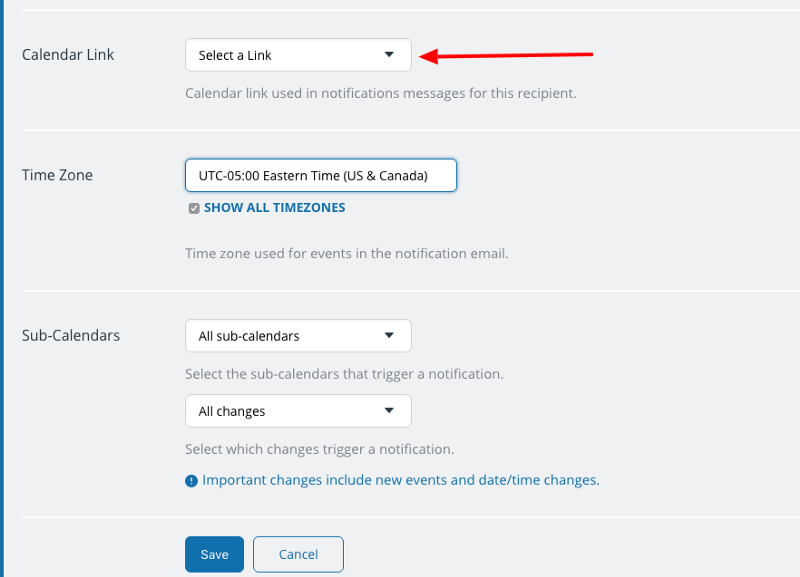 If you’re an admin, don’t use your administrator link as the calendar link that connects to Slack. Instead, use a calendar link that includes only the sub-calendars — with appropriate permissions for each one — that you want the entire group to be able to access. Everyone who can access the group channel can access the calendar link. Create a calendar link that includes the right sub-calendars and has appropriate permissions set for each one. You can also receive notifications about changes on your calendar via your private channel on Slack. If you are a non-admin user and you want to share calendar notifications to a group channel, here’s what to do. Step 1: Get an appropriate calendar link. 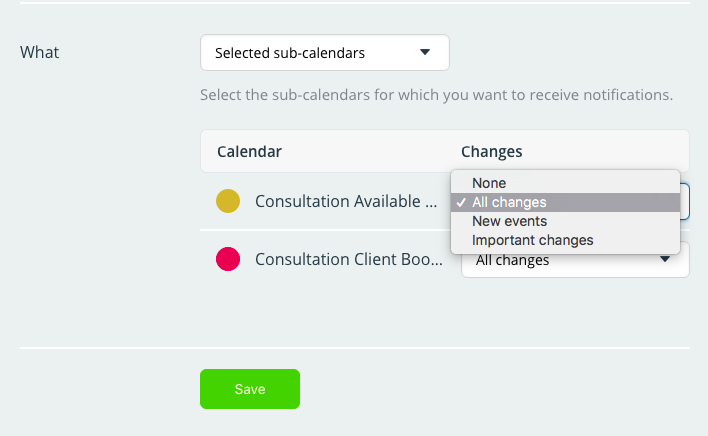 First, request a calendar link from your calendar admin. Access the calendar using the calendar link with appropriate permissions. Use the calendar link you set up for Slack notifications to access the calendar. Click on Notifications to open a Preferences window. Click on the Slack Notifications option in this window. Click the Add to Slack button. This will take you to Slack.com to obtain the necessary authorization. Click the Add to Slack button to choose the Slack workspace and channel. Step 3: Set up the details in Slack. Click on the Add to Slack button, and a window will open so you can set your preferences. Select your Slack workspace, then select the group channel you’re using to share calendar notifications. Remember that all posts on Slack will contain the calendar link from which you are setting up the notifications. If you share calendar notifications to a group channel, anyone in the group can use your calendar link. Once you’ve chosen the Slack workspace and channel, click the Authorize button to give Teamup permission to post messages to your selected Slack channel. Step 4: Set your notification preferences. Select the sub-calendars you want to include in notifications in the group channel. Then you’ll choose the type of events. You can select New events, Important changes, or All changes. Important changes include newly created events and time/date changes on existing events. 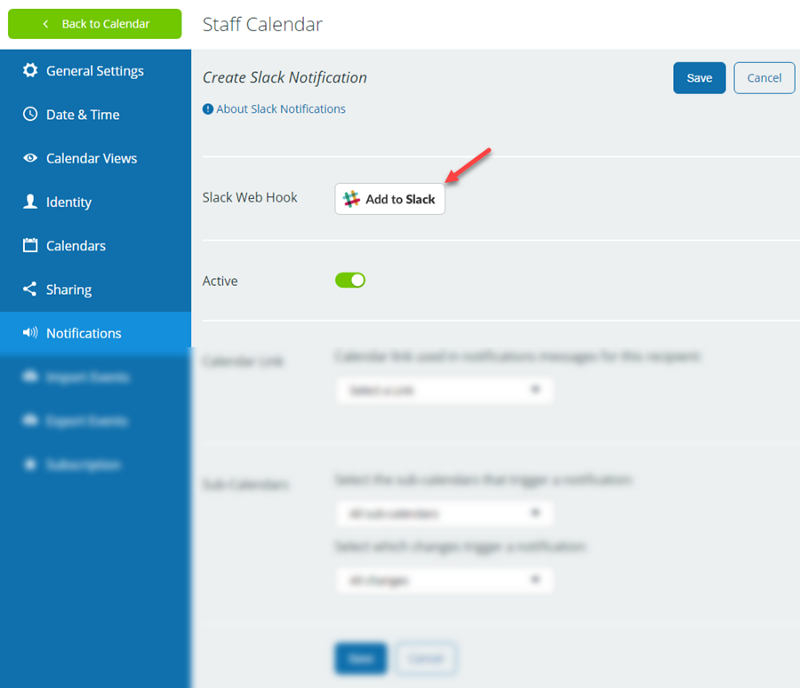 If you’re a calendar administrator and want to set up Slack notifications for a group channel, follow these instructions. 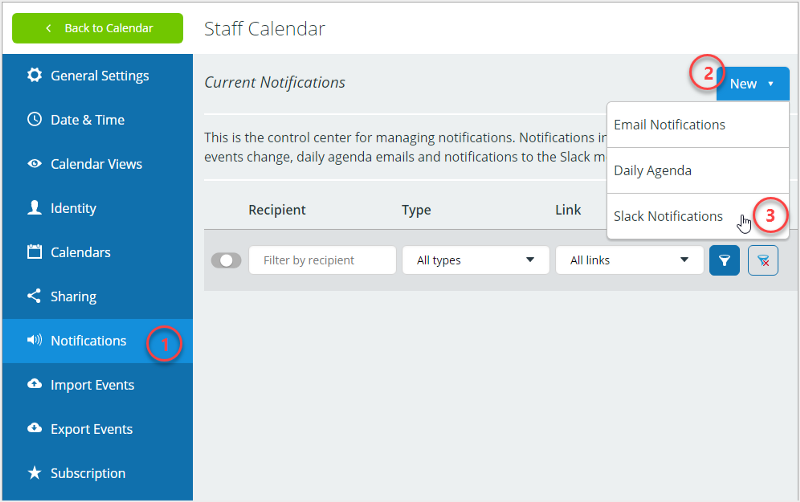 From the calendar administrator link, go to Settings, then select Notifications > New > Slack Notifications. Calendar administrators set up Slack notifications from Settings > Notifications. Click the Add to Slack button. This will take you to Slack.com to obtain the necessary authorization. If you try to save before obtaining the authorization, you will be prompted with an error. Select the Slack workspace and the channel you want to use. Your currently active Slack workspace will show up as the default integration option. If you want to choose a different workspace, simply use the drop-down menu in the top right corner. Only the workspaces you are currently signed into will appear, but there’s also an option to Sign into another workspace. Once you choose the workspace, there will be a drop-down window with all the eligible channels contained in that workspace. Choose the channel you want to use for calendar notifications. Click the Authorize button to give Teamup permission to post messages to your selected Slack channel. After authorizing Teamup, you will be redirected back to your Teamup Settings to finish setting up the integration. Step 4: Select the link, sub-calendar(s), and changes. Now you’ll choose the calendar link to use for Slack notifications. Select the drop-down menu by Calendar Link to see a list of all available calendar links. Select a link with access permissions that are appropriate for all members of the group channel. Choose a link with appropriate permissions when you set up Slack notifications. Notifications posted on Slack will contain this link, which members of the channel can click on in order to open the calendar, see more details, or take actions if needed. It is therefore very important to ensure that they are entitled to access the calendar with the permissions assigned to this link. 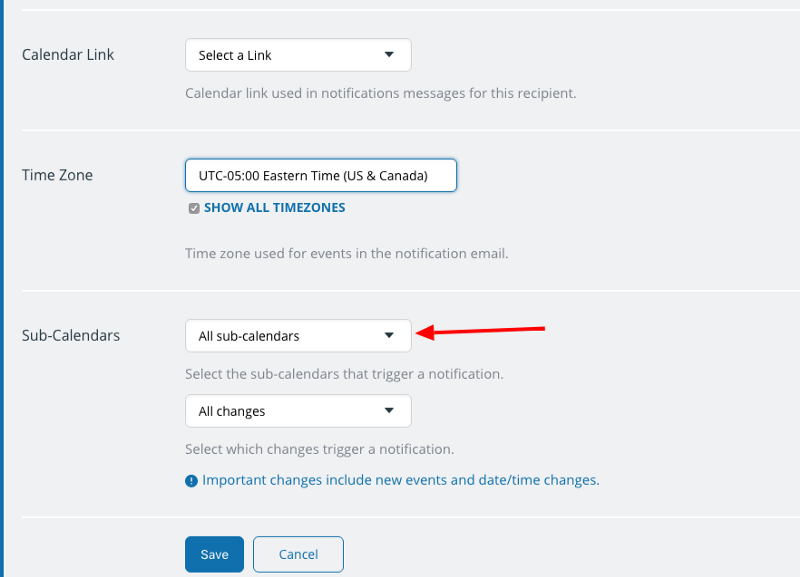 Once you’ve chosen an appropriate calendar link, you can choose to receive notifications for changes on all sub-calendars or only one or more specific sub-calendars. Choose all sub-calendars or select the ones you want to include. Finally, choose the type of changes you want to include in the notifications: All changes, new events only, or important changes. Important changes include newly created events or time changes of existing events. To test the Slack integration, simply add, edit or delete a future dated event in your Teamup Calendar and wait for the post from Teamup to appear in the Slack channel you have chosen. It should happen within about 60 seconds. Be sure you test your notifications with an event you’ve allowed in your Slack channel; for example, if you chose to show “New events only,” then you need to create a new event to receive a notification in Slack, since modifying an event that already exists won’t appear in your notifications on this setting. From the Slack notification, click on the calendar name to open your Teamup Calendar. Check that the correct link has been used. In particular, be sure that it is not a link with the administrator rights or other inappropriate modifying permissions. You no longer need a Slack integration for any group channels. You have accidentally set up duplicate integrations and want to remove one or more. Any employees who have previously setup a Slack integration to post notifications to their private channels but have now left your organization. Non-admins can remove a Slack integration easily. From the Slack app, go to the app directory and delete the integration with Teamup Calendar. From your administrator link, go to Settings > Notifications in your calendar. You will see an overview of all existing notifications that have been set up by all users of the calendar (including the administrator and non-administrators). This requires administrator access to your calendar. From this window, you can manage all notifications. You can toggle a Slack integration off using the button on the left side of the notification listing. Or you can delete or edit a Slack integration. Click the edit button on the right side of the notification listing. From there, you can duplicate, delete, or modify the Slack integration as you wish. Alternately, from your Slack app, you can go to the app directory and delete the integration with Teamup Calendar. 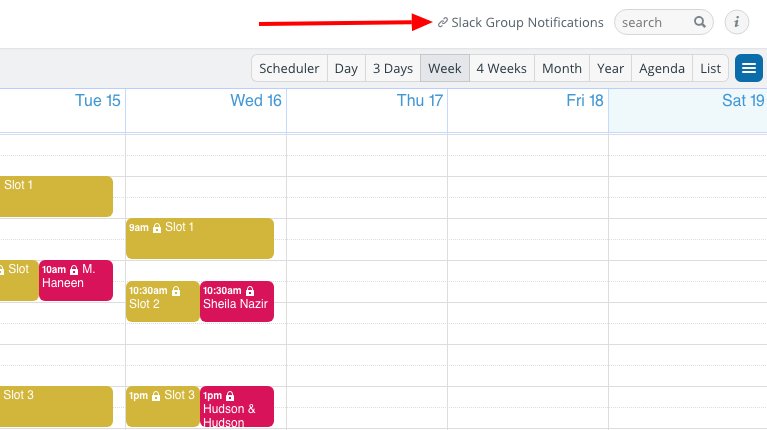 Granting access to Slack notifications is granting access to your calendar. You can limit and control the calendar access granted by using an appropriate calendar link and sharing it with the right people. In most cases, it is recommended to create a customized link specifically for the members of this Slack channel, unless an existing link is appropriate for the channel. It’s a good idea to create a designated Slack channel solely for calendar notifications, and make it a private, invite-only channel. That way you can control who sees the calendar notifications and can access the calendar. If you already have a public channel you want to use, you can convert it to a private one. You can find more information about posting notifications to a Slack group channel here. Header image by rawpixel on Unsplash.